Welcome to the latest post in our Closer series — a look at how technology brings couples, family, and close friends closer. Christina and David are in their twenties and currently in a long-distance relationship. 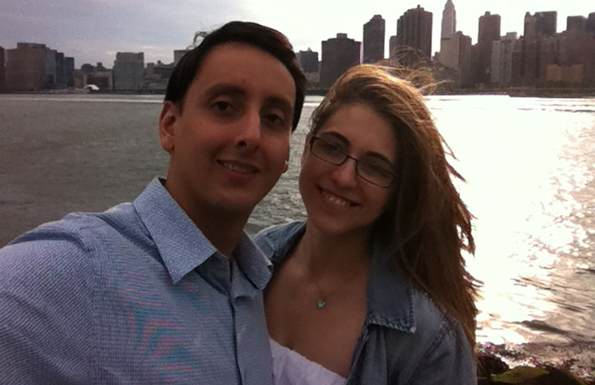 They both lived in New York City when they first started dating, but for the past year David has been living in São Paulo, Brazil while Christina remains in New York City. Christina: The two things that we use the most are Skype and Kik Messenger. We use Skype to see each other as much as possible but we use Kik Messenger 24/7, just to send quick messages, to update each other on what we’re doing. It’s always with us. David: Kik was actually something you introduced us to Elliot. Before that I was using WhatsApp and Viber, but I actually really like the functionality of Kik. As Christina said, it’s real time, so whenever something important is happening in one of our lives, or we make an observation in our daily lives, we can share that with each other. It’s a great way to stay close when you live an ocean apart from each other. We’re trying our best at maintaining a long-distance relationship and technology really helps. Christina: Kik is great because I can even see when he’s typing — it’s that instantaneous. It’s almost as if we’re having a face-to-face conversation because it’s so fast. David: Sometimes we find ourselves randomly emailing each other, but I’m not sure what the protocol is because sometimes we’re emailing each other, sometimes we’re using Kik. I don’t really know why we do that when we can use Kik all the time! But something Christina mentioned about Kik — being able to see that the other person is typing – it really does make you feel closer because you feel like the other person is on the other end. Although it’s not a true connection, it’s a stronger connection through Kik. Christina: Actually, that became part of a sad point when he left because we used to play Words with Friends all the time together, and then when he left, you know I had other games with other people, but it was like, I needed some time away from Words because it was such an important part of our lives together. It was really interesting, it became so sentimental. David: We could play right now, we have the capability – but we just haven’t gotten back into it. I think I’m ready Christina, are you? Christina: (Laughs) I’m ready to take you on. Unbucket: Could you imagine being in your long-distance relationship without access to the technology you have today? Christina: I think it would just be really different. It’s hard to imagine it without the technology because it’s such an important part of our relationship. Seeing him on Skype is so different than if it was fifty years ago and we only could write letters back and forth to each other. It’s really hard to imagine without the technology. David: I completely agree. It would be much, much, much harder to have to write letters or spend a lot of money on international calls or something like that, so technology really facilitates interaction and makes this situation a lot more cost effective. Just the fact that you can see the person really, really makes a big difference. I just can’t imagine how difficult it would be without being able to see Christina pretty much on a daily basis. Christina: Well, I worry a little bit because everything we do is over the internet. All our conversations, whether it’s written over Kik or video over Skype, it’s all there. You wonder, where is this information, who can see it, who can access it. It’s more of a passing thought in the back of my mind, but I don’t worry about it too much. There is so much information out there, what would they do with it? It’s just our personal lives. It’s not a big deal really. But it is a thought in the back of your mind. David: I don’t really think about it that much either. I think it just goes with technology these days. We’re putting a lot of trust into these companies. I don’t know who the founders of Kik are or if they’re reading our personal messages, but we all place a certain amount of trust into this technology. To me it’s worth it because the benefits really outweigh the cost of potential privacy issues. From another perspective, with Facebook, Christina and I tend to be a little bit more conservative with what we share. We tend to keep our “virtual PDA” between us. We may every once and a while say something publically, but I think it’s really best said in private whether that’s over Kik or over the phone or when we’re in person. I almost think it gets a little out of hand with over-sharing between people and couples, or just people in their daily lives. People tend to lose sight of what they’re sharing and who gets to see all of their personal moments over a medium such as Facebook. Christina: I agree. I definitely try to keep personal, personal stuff off of Facebook. I don’t think all the random contacts I have should know or care about the really personal things that should be kept private. Unbucket: Are there any non-traditional ways you are staying connected through technology? David: Christina is really into Yoga and is a yoga instructor, so something Christina and I are going to try pretty soon is doing yoga over Skype on an occasional morning. David: Once a week! (Christina laughs) It’s my promise to her. Christina and I also like to send – same with you Elliot, please don’t get jealous – songs to each other. David: With technology, as much as we tend to share and do things over the internet or applications, Christina and I do send each other hand-written cards and things like that. I think a hand-written note, even though it may seem a little out-dated, still resonates between the both of us. Christina: Man, definitely. It’s still really special to send stuff and to get stuff from him.